Ah, the life of an entrepreneur. Some try it, many don't like it, but one thing is certain - it is hard to truly understand it until you make the decision to jump in with both feet. Transitioning from a side hustle to a full hustle, getting out of your comfort zone, is what our event was all about. As an entrepreneur myself, I found that I was relating to each woman on the panel in different ways. This blog will recap the insights from the event, along with my own learnings along the way. Click here to read about each panelist's story, watch the discussion (we streamed it for you! ), and catch up on the latest news from YWiB TO. Want to know more and connect with them? Visit their websites and follow their social channels! It can be exciting, scary as hell, overwhelming, exhilarating and so many more emotions when you take the leap of faith to becoming an entrepreneur. When you are working, you have the security of a paycheque every two weeks or month, and it can seem daunting of a decision to make. Our panel weighed in on how they knew they were ready to take the plunge. For Vicki, our newest entrepreneur, it was a combination of enough savings, and unhappiness at her job. Her confidence in her network provided her with support through the transition. Renish shared that it was an emotional decision - she could feel it was the right thing to do, it moved her. She shared a serendipitous encounter with a stranger who was inspired enough to invest in her after overhearing her idea, and having confidence in her passion. Personally, I believe the universe sends us signs, and that was definitely one. Mary delved into the world of conscious consumerism in her schooling, and received immediate interest in her ideas. While she never imagined going straight from school into entrepreneurship, research and support from her family and Futurepreneur brought her long-term goals into fruition. She insightfully suggested to take the leap when you are 80% confident. Confidence is integral to Paloma's journey as well. She values freedom, and doesn't like taking orders from anyone, so for her, entrepreneurship was the only option. Freedom is something sought after for many entrepreneurs, and Paloma could not agree more. Personally, I think having a balance of emotional and rational decision making is important. Entrepreneurship will never appeal only to your rational mind. No steady income. Sporadic interaction with colleagues (if you start a business solo). Very little structure. Many more hours involved. A lot more rejection. How will that ever make sense? It makes sense because you also have to appeal to your emotions, to your values, and fall back on your hope and confidence. Balance is key, and I love the 80% rule here too... don't wait until you are 100% sure... you might never get there. That last 20% is hope... and you will need to use your drive to succeed. For Vicki and Renish, (and myself) family values and perceptions was a challenge. It can be hard for those who love us and have grown up in a different landscape to truly understand this decision. Cultural backgrounds can be a factor that adds some spice to the mix (see what I did there), as it is hard for South Asian families to see a woman in this role. Paloma warns of sharing the tiny flame ideas with those who might blow it out before it has a chance to grow. We have all experienced that, even if it isn't related to a business idea and it is never a good feeling. As she lives with ADD, she described how this can both a blessing or a curse - depending on how you see it. She beautifully articulated how the aspect she thought would be her downfall is actually her fuel. Even with the support of family, managing work-life balance is hard. Mary accurately describes something we all experience... hearing the advice from other entrepreneurs about work-life balance, and dismissing it, thinking it won't happen to me, until it does. One key theme that emerged in the panel is the notion that it is all part of the journey. This resonated with me. As an entrepreneur, I value the aspect of networking and have been to different events, and connected with different mentors and leaders. I hear advice and feedback, yet it is only until I experience it myself that it truly comes to life and becomes real. Challenges entrepreneurs experience might be similar or unique based on numerous factors, but Renish points out that our challenges can be fuel. It can make us stronger, and it has made her into the mentor that she never had. Looking back, Paloma would try to remind herself that it she is building relationships, not just providing a one-off service. She suggests to create an Excel spreadsheet and keep track of people, and take time to check in with them. Mary has learned the huge impact of self-compassion - acknowledging there will be hurdles and being kind to yourself if you can't be everything all the time. This is one of the core components when I work with clients in a counselling setting, as well as in the trainings I run for wellness & resilience. In my work, I host corporate workshops on the topic of resilience, and teach positive habits that we can include in our lives to boost our well-being, which does make us more resilient and happier in our personal and professional lives. I am currently with York University as a Counsellor Intern & Ryerson University working on the Thriving in Action initiative, with Diana Brecher (creator of the Five Factor Model of Resilience), and I am the Founder of Choose Gratitude, an organization dedicated to improving the well-being in our world through workshops and presentations. I've had the opportunity to work with law firms, financial institutions, small businesses, schools, and non-profits, and irrespective of the industry, these concepts and tools resonate, and are invaluable. I teach people about themselves (why we do the things we do, and what happens in our brains), & why incorporating new skills (such as gratitude) can be beneficial. When an executive and a new employee can connect over an exercise on gratitude, it is something special. When lawyers give me feedback wishing there were more people who attended, I recognize the need for this message to extend further. When hearing the challenges and learnings from the panelists, I recognize that each of us experience similar sorts of adversity. As young women, it is especially important to remember that and to lean on each other for support, guidance, and connection. This is why events like these are so powerful - having the courage and vulnerability to have these conversations can be impactful irrespective of your role. During my time as a volunteer with Young Women in Business Toronto, I have had the pleasure of being the Director of Community Engagement and Acting President, working behind the scenes to grow the organization and pull off events like this one, yet as I've needed to transition out of these roles, I found myself at the event as an attendee, feeling the positive energy we always have in a new light. I am so proud of the values and initiatives ingrained in the organization, and encourage young women in Toronto to share this with friends, and grow this engaging, inclusive, and supportive community. Our panelists left us with the reminders to be unapologetic in our beliefs. Don't allow ourselves to be treated as commodities. Do not let the guilt or insecurity take over. Stay focused, even if it means putting blinders on sometimes. Let the journey become yours. I say we should embrace all the moments. Cherish the challenges and the successes. Feel thankful for each person that helps you along the way. Acknowledge yourself in the process. Choose gratitude in all its forms to empower you along your journey... whatever that may be. 3. writing - good selling is finding the right match, and knowing who you are will inform your voice and find your people. 3. balance - to avoid burnout. 3. decisiveness - know when to chill out. 3. ability to get over feeling guilty. Click the links below to see our latest event. We're hosting an entrepreneur panel discussion! From a young age, Mary Young knew she would be an entrepreneur in the creative realm. From knitting clothes for her Barbies to making prom dresses in high school, she always had a passion for all things fashion. After studying Fashion Communications at Ryerson University, she discovered the lingerie industry. Today she is designer of her namesake line MARY YOUNG Lifestyle Lingerie, which features ethically Canadian made lingerie and loungewear that embraces the natural woman’s body. I'm a Jill of all trades. I love using my hands to build things in whatever I do. I hope to cause a positive effect on those around me. I've been creative from such a young age, from knitting clothes for my Barbies to making prom dresses in high school, I knew fashion was an industry that I would end up in. I love being active, both socially and physically. If I'm not working then I'm having a Matcha with friends over brunch or at a spin class getting in some cardio. How did you begin MARY YOUNG Lifestyle Lingerie? Was this something you'd always planned to do? Growing up I always knew I wanted to be an entrepreneur; what that looked like I never fully knew, other than it would be in the creative realm. When I was at Ryerson studying Fashion Communications I decided to do a double thesis in my fourth year. I produced both a written thesis as well as a five-piece womenswear collection that was shown with the Fashion Design graduating class. I honestly stumbled upon lingerie during my fourth year, I started my collection with hand knit sweaters and as I was building out the full concept I concluded lingerie would be a great pairing with cozy knit sweaters for the contemporary woman. After studying the lingerie industry so in-depth for months I knew that there was a gap in the market for lifestyle lingerie. It also became clear to me that the lingerie industry really only offered one 'look' for models and women, which is far from reality and I wanted to address that with my collection. MARY YOUNG Lifestyle Lingerie designs all lingerie and loungewear with a focus on empowering women and appreciating their natural body. Why do you feel this is so important? Growing up, I always felt pressure from the media, the fashion industry and really society as a whole, to act and look a certain way as a woman. I never once felt reassured, aside from my family and friends, that who I was at my core and my natural looks were enough. I know I'm not the only one to feel this way and I want to make sure women realize that their natural shape and who they are is more than enough, and they are truly beautiful. I think it's time we change the narrative of how a woman is spoken about, how she is told to look and act, and encourage everyone to embrace their individuality in all forms. What do you love most about being your own boss? The best thing about being my own boss is seeing all of my hard work, from idea, creation to execution, come to life. Knowing that all my hard work, those late nights and stress worked together to build something that can connect and reach so many other people. My biggest advice is to learn self-love, and I know that sounds cliché but it's true. You will always be your own worst critic, you'll see the areas you fell short or the flaws in your finished product, but if you can't support, encourage and love yourself through the journey it will always be an uphill battle. Without loving yourself and speaking to yourself positively, you will always feel less than rather than embracing and celebrating your successes along the way. Young Women in Business Toronto is incredibly grateful to have aligned with a sponsor who recognizes our mission. We thank you, Tangerine, for your on-going financial support, encouragement and use of your physical space as a venue for our events. YWiB provides a central forum to connect ambitious young women from across educational fields, careers, and industries. Tangerine is conscious of the fact that we are a new chapter development and still establishing ourselves as a go to source for recent graduates and professionals looking to network with others. They provide the resources necessary for us to succeed, whether we are pursuing entry-level or higher jobs, or striving to become successful and money-savvy entrepreneurs. Tangerine is a direct bank that delivers simplified everyday banking to Canadians. With over 2 million Clients and close to $38 billion in total assets, we are Canada's leading direct bank. Tangerine offers banking that is flexible and accessible, products and services that are innovative, fair fees, and award-winning Client service. From no-fee daily chequing and high-interest savings accounts, Credit Card, GICs, RSPs, TFSAs, mortgages and mutual funds through its subsidiary, Tangerine Investment Funds Ltd., Tangerine has the everyday banking products Canadians need. With over 1,000 employees in Canada, our presence extends beyond our website and Mobile Banking app to our Café locations, Pop-Up locations, Kiosks and 24/7 Contact Centres. Tangerine was launched as ING DIRECT Canada in 1997. In 2012 it was acquired by Scotiabank, and operates independently as a wholly-owned subsidiary. 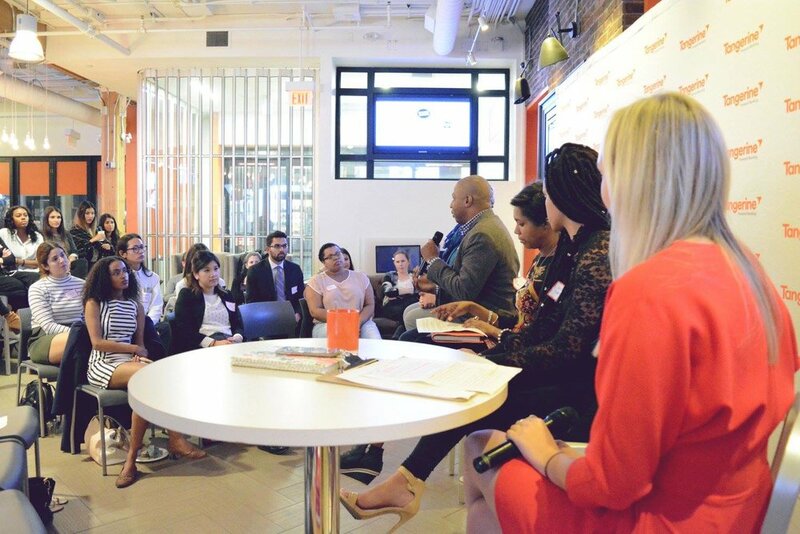 Join us at Tangerine Downtown Toronto Café on Tuesday, October 24 for From Side Hustle to Full Hustle: Entrepreneur Panel. Arrive before 5:30pm on the day of the event if you’re looking to speak to a representative about opening a new bank account! She is anything but ordinary, turning "no" into "yes" faster than you can say "Chutzpah". Paloma Lev is the leader of the Badass Communicators club, passionately teaching talented people to get out of their own way by teaching confidence, selling, pitch and copy. She has a way with words that puts Shakespeare to shame; with a master of English from the University of Toronto and 6+ years of coaching, we can say she is a master of her craft. Renishaki Kamal, well known as Renish, is an Arts and Environment Graduate from the University of Waterloo. Today she is the Founder and CEO of Fidget Toys Ltd., an educational support toy company. Victoria Stacey is the owner and editor-in-chief of Florals & Teacups, a blog and lifestyle brand that works online with brands to amplify and create awareness for their products and services. She is a founding member of the Young Women in Business Toronto chapter and our current Partnerships Coordinator. She has been integral to our success as an organization.